No doubt you’ve heard of the ‘kitchen work triangle’, a concept used to establish the most effective layout of a practical home kitchen. It is based on the premise that the three most important and utilised areas of a kitchen are the sink, the refrigerator and the stove top. The imagined lines between these three areas draw a triangle. The ‘kitchen work triangle’ suggests that each area should be no less than 1,2m from the other and no more than 2,7m. Developed in the 1940’s, it could be argued that this concept is outdated and does not consider the modern lifestyle importance of the kitchen i.e. the fact that today, the kitchen is often the heart of the home and caters for more than food preparation, cooking and storage. 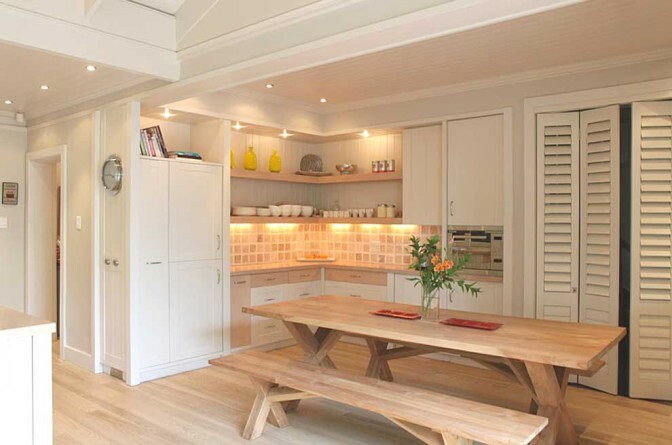 However it does force one to apply your mind to the most practical kitchen layout for your home, and the principle of the ‘kitchen work triangle’ still applies; to create a space that enables efficient, uninterrupted workflow irrespective of your chosen configuration – L-shaped, galley, U-shaped or island style. There are three types of lighting to consider in a kitchen; general or ambient lighting, task lighting and accent lighting. General lighting pertains to the overall lighting of the area and is intended to light up the area equally. This lighting can be in the form of ceiling-mounted or wall-mounted lighting. Task lighting, as its name suggests pertains to the lighting of an area used for specific tasks or function, such as a kitchen counter used for food preparation. Accent lighting highlights a particular object or feature of a room. When developing a lighting plan for a kitchen it is suggested to start with ambient lighting and thereafter focus on task and accent lighting. 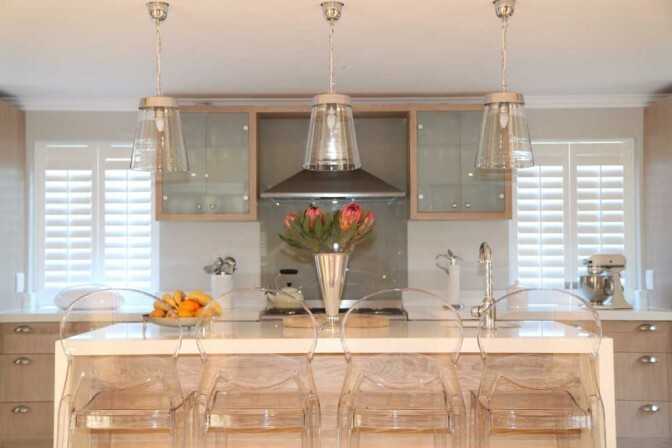 In addition to these three types of artificial lighting, good kitchen design considers the best way to utilise the available natural light. Installing practical window finishes such as blinds and shutters to allow in the maximum amount of natural light is as practical as it is stylish. 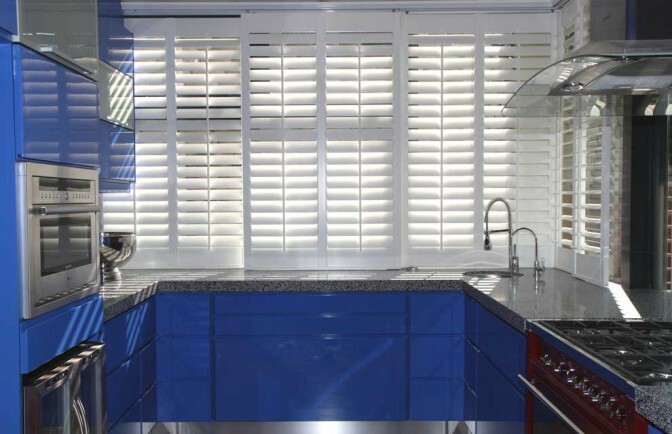 We recommend our eco-friendly Decowood range of shutters for use in kitchens; hard-wearing, easy to clean and stain-, peel-, crack- and chip resistant. One of the most common kitchen complaints is the lack of usable practical counter space. When designing or renovating a kitchen spend at least as much time on the amount of counter space you need as you do on the type of material to use; ensure that you consider what items are to be stored or displayed on the countertops as well as the layout in terms of proximity to food prep and cooking areas. 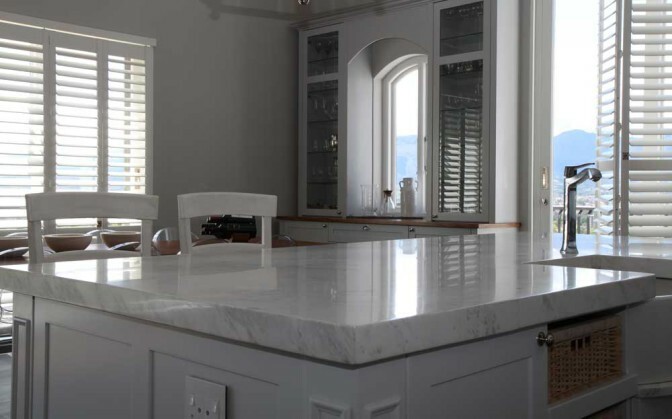 When it comes to kitchen countertop material options there is a wide selection to choose from, from the budget-friendly laminates to the sought ofter hard-wearing granite, quartz and concrete, as well as wood, marble and even stainless steel. Another one of the most common complaints re kitchen design is the lack of storage space. When looking at your kitchen layout be sure to use all the space available for storage; utilise vertical space as well as horizontal space, and look for clever storage solutions for awkward corners or deep cabinets. There is nothing worse than smelling last night’s curry in your kitchen the next morning. If a kitchen has poor ventilation, the cooking odours linger longer than they are welcome. Natural ventilation is most important – windows and doors allowing in fresh air and allowing smells and fumes to escape. Install practical window finishes that are easily manipulated to open and close and direct ventilation such as shutters and blinds. They can be completely opened or with a tilt of the louvres or slats, the breeze can be directed as you wish. 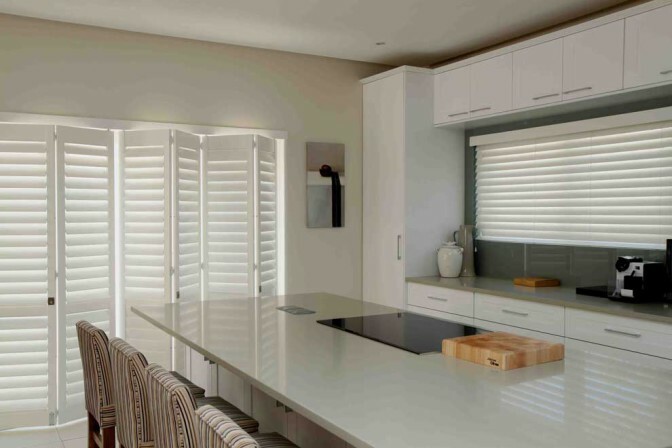 AMERICAN shutters recommends our Fauxwood blinds range for kitchens because they are ideal in humid areas and great value for money. 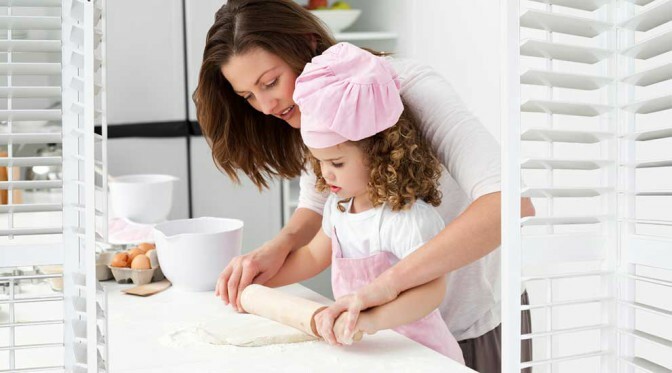 In kitchens that lack natural ventilation, there are many products on the market that can assist in keeping your kitchen fresh and smelling great, such as extractor fans, cooker hoods, fans and vents. Follow our kitched design advice and you will soon be high-fiving like a chef.